Auli is an important ski destination in the Himalayan mountains of Uttarakhand, India – COME MAKE IN INDIA.SELL ANYWHERE AROUND THE WORLD. Auli is an important ski destination in the Himalayan mountains of Uttarakhand, India. 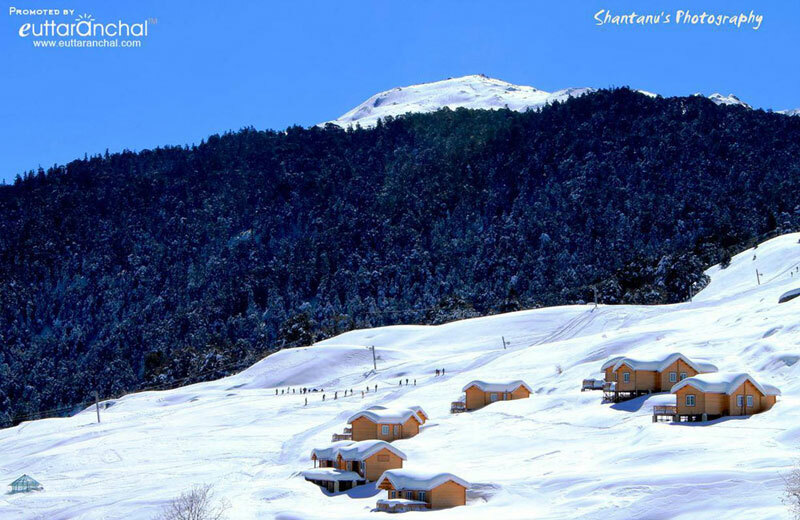 Auli, also known as Auli Bugyal, in Garhwali, which means meadow, is located at an elevation of 2500 to 3050 meters above sea level.Auli is less known ski destination thanShimla, Gulmarg or Manali. It was only in the recent time, after the creation of new state Uttarakhand carved out from Uttar Pradesh, Auli was marketed as a tourist destination. The state is called “Devbhumi” which means “Land of the Gods” as there are important pilgrimage destination in this state mainly the ‘Char Dham’ (Gangotri-Yamunotri-Kedarnath-Badrinath). Auli lies on the way to Badrinath. Auli is surrounded by coniferous and oak forests, with a panoramic view of the lofty peaks of one of the greatest mountain range in the world, the Himalayas. The slopes here provide enough thrill to professional skier and novice as well. The Garhwal Mandal Vikas Nigam Limited (GMVNL) a state govt agency which takes care of this resort, and Uttarakhand Tourism Department conduct winter sports competitions at this place to encourage skiing in India.have imported snow beater to maintain slopes. Auli also boasts the Asia’s longest – 4 km – cable car (Gondola). It also has a Chair Lift and a Ski-Lift. Apart from Skiing there is an interesting trek route also. There is a training facility of Indo-Tibetan Border Police. A small temple having connection to legendary Hindu epic Ramayana is also present. Best time to visit is last week of Jan to first week of March for skiing. Though weather is highly unpredictable. Skiing is a major pastime in Auli . Facilities for skiing are available from GMVNL. There are certificate and non certificate course provided ranging from 4 days to 14 days. The courses includes stay, food, ski gear charges and guide. There are local people who provide Ski Equipment for the casual tourist and also help them to ski. If you have a weeks time, then it is possible to enroll in Ski courses and learn from experts. Auli along with Dehradun hosted the First South Asian Winter Games in 2011. Artificial lake The world’s highest man-made lake is at Auli, right next to the private hotel, Clifftop Club. The government has developed this in view of creating artificial snow on the new ski slopes in the event of low snow fall. The water from this lake will be used to feed the snow guns stationed along the ski slopes and thus provide a good skiing surface and exend the ski season. Auli, the picturesque hill station of Uttarakhand, is a round-the-year destination. If you like to glide down snow-covered slopes in extreme chilly conditions then winter (December to February) is the best time to visit Auli. It is one of the best skiing destinations in India. For those who want to rejuvenate in the beauty and tranquility of nature, summer (March to June) is the best time to visit Auli. Pleasant weather conditions, clear views of the surrounding beauty and wonderful trekking and hiking trails make Auli a perfect destination to beat the sultry summers of plains. The nearest airport is Jolly Grant Airport in Dehradun, which is about 281 km from Auli. Jolly Grant Airport in Dehradun is a domestic airport located at about 20 km away from city center of Dehradun. Taxi cabs are available from Dehradun airport to Auli, which cost about Rs 4,000. The airport operates daily flights to Delhi. Nearest International airport is Delhi, which is about 500 km away. Auli is a popular hill station in India. Listed below are the tourist spots in and around Auli. 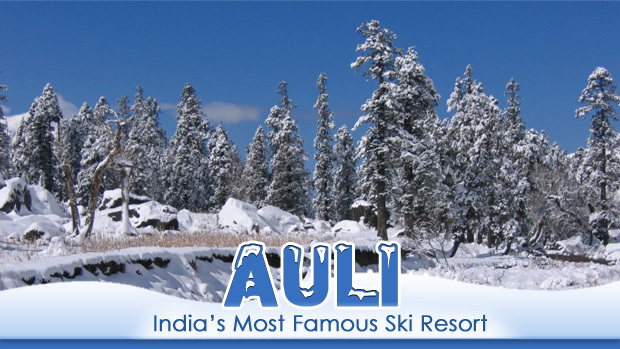 Auli is starting to get popular among the ski-lovers. Though the long,tiring travel and unpredictable weather can be the mood killer. You cannot be sure till you reach what to expect. Few lucky can get to enjoy snow fall and skiing. If luck is not on your side, snow storm can lock your room for days. For some its hard solid snow which take away the skiing pleasure. Though the GMVNL has imported snow beater it cannot give the experience of fresh snow. There is a long Ski-Lift connecting lower slopes to the Top. The gondola is not an aid to skiing and simply transports visitors to the accommodation centre from the local village and the one serious ski lift, as well as being short only operates when there are four people to fill the available seats. This does lead to long delays between runs. The ski village suffers from a shortage of electricity and to be restricted to one hour of power per day is not unusual in winter. A 500 m long ski-lift carries skiiers back to the slope top, thus saving them the trouble and time to bridge up wearing long skis. Equipment: GMVN provides modern ski equipments. Participants are advised to bring heavy woolen clothings like caps, socks, gloves, mufflers, pullovers, trousers, wind proof jackets, dark glasses, gum / snow boots and a torch for personal use. The world’s highest man-made lake is at Auli, right next to the private hotel, Clifftop Club. The government has developed this in view of creating artificial snow on the new ski slopes in the event of low snow fall. The water from this lake will be used to feed the snow guns stationed along the ski slopes and thus provide a good skiing surface and extend the ski season. Kuari Pass trek is the most famous trek which start from Auli. Kuari which means “doorway” is a Himalayan high mountain pass situated in the Garhwal region of northern India, south of the Tibetan border and on the western rim of the “Nanda Devi Sanctuary” Biosphere Reserve and falls in the Chamoli district. The Kuari Pass Trek found fame in the early 1900s when intrepid adventurers and mountaineers such as Lord Curzon, Eric Shipton and Bill Tilman used the passage in their pioneering explorations of the region.The Kuari Pass trek is known as The Curzon Trail (named after the former British Viceroy Of India “Lord Curzon”). Winter Kuari Pass trek is also can be undertaken to enjoy the snow trekking. The place Auli is surrounded by the mighty peaks of Himalayas. Most of them have some name of goddess or some mythological connection. The one that stand out is beautiful Mt Nanda Devi which stands 7,817 Mts (25,643 ft) in height. Even the Mt Neelkant visible. Auli lies in the way of the Badrinath route. So in winter there is a heavy snow fall in Badrinath and the temple is closed for 5–6 months. During this period the deity of Lord Badri Vishal is brought and kept in temple at Joshimath. This is golden chance for Hindus and not to be missed. In Auli there is a small Hanuman temple having some connection to Ramayana. The belief of people is when Laxman, younger brother of Lord Rama got injured fighting the Rakshas in Lanka (Sri Lanka). A medic ordered that only the herb name ‘Sanjivani’ found on Sanjivani mountain in Himalayas can save Laxman. Lord Rama ordered Hanuman the task. Hanuman flew from Lanka and during his way to Sanjivani mountain he took some rest in Auli before continuing his journey. There is a training facility of Indo Tibetan Border Police. This force is responsible for guarding Indian borders at high altitude. They are subjected to hard training and its amazing to see their stamina and skiing skills. This center is equipped with best medical team for any emergency and tourist can use their help. If tourist gets trapped then the chopper service can be requested for rescue or transfer to city medical facilities. A Hydro Power project can be seen from Auli. A private company has trapped the flowing river Alaknanda and diverted its waters through a big tunnel that runs under the mountain and the force acquired is used to generate electricity. To see this you will have to travel some 5 km towards Badrinath. Vishnu Prayag – It is a holy confluence of river Alaknanda and Dauli Ganga. Accessible from the Joshimath. Badrinath – One of the four Dhaams. Very important for Hindus and who worships God Vishnu. Its closed in winter. Tapovan – ‘Tapo’ meaning meditation, ‘van’ means forest in Sanskrit. The place is 15 km from Joshimath and has a temple and a natural hot water spring.